Appointment Center Plus is a service that ShowingTime offers to showing agents, inspectors, and appraisers to help schedule appointments. The Appointment Center Plus service will allow ShowingTime to make all reasonable efforts to confirm an appointment that’s scheduled on behalf of Appointment Center Plus customers. Note: There are no un-schedulable listings for Appointment Center Plus agents. We are an extension of you and we provide branded communication on your behalf. Instead of chasing down contacts and playing phone tag, the busy work is handled by your ShowingTime assistant so all your appointments get scheduled quickly. ShowingTime Appointment Center Plus provides a simple solution to what can be a frustrating, time-consuming process. 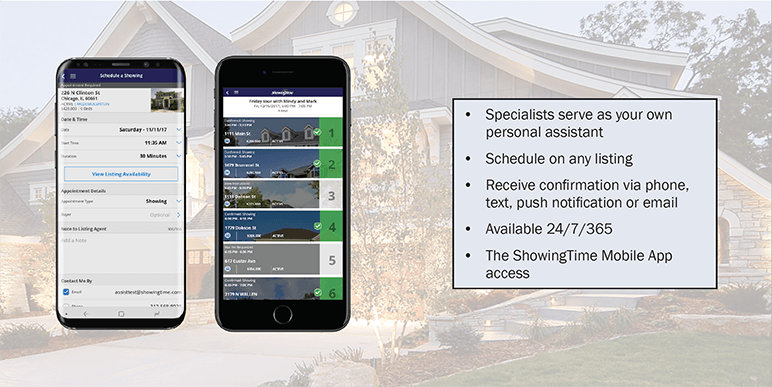 ShowingTime Appointment Center Plus is a perfect way to have your very own assistant - at a fraction of the cost - to take care of all your appointment scheduling. How is scheduling via Appointment Center Plus different from other scheduling options? You call us and give us a list of listings you want to see. We handle all the back and forth phone tag to get you scheduled on any listing. Will it work with the other ShowingTime products I currently use? Yes. You get feedback requests as normal and listing agents are able to receive these responses.